"Oh just shut up. I'm tired of your nonsense." He yells at his wife. "Really? Imagine how tired I should be after putting up with you all these years?" She retorts. "Get lost. I just hope that the divorce comes through soon." "Why should I leave? This is my house too. You leave. And yes, I cannot wait for the day the divorce comes through. I'll celebrate like there is no tomorrow." "Yes. Another excuse for you to get drunk." "I only started drinking after I married you." "Oh, how I wish I had not. Atleast I would have been happy for the last ten years." "Its never too late. You can get out and stay happy." "This is my house. I want you out of it." "I paid for this house too. Half of it is mine." "Fine. You keep this half. I keep the other." 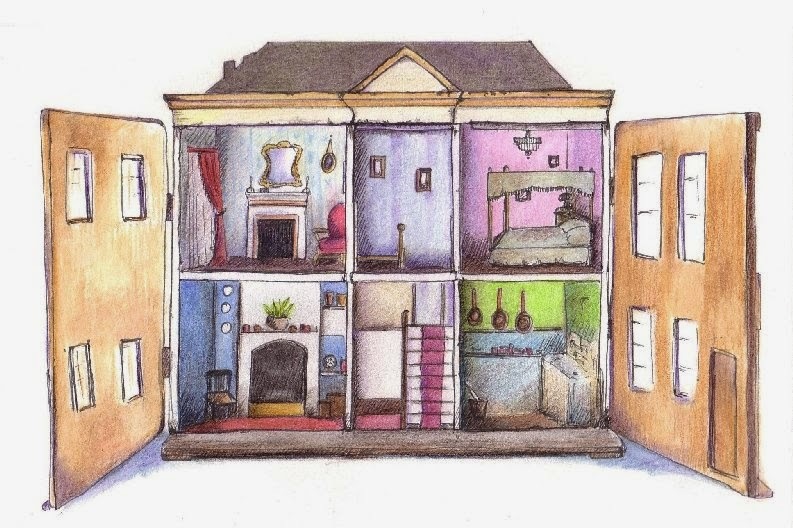 That night just before going to bed, little Sara draws a line at the center of her doll house using a chalk. Just like how her parents had. Aww, poor little Sara. It's always the little ones who pay the heaviest price. Dropping by from the A-Z - Good luck for the rest of the challenge! I know! That's the sad part. Wow... For the presentation. A sad truth the child pays for the behaviour of parents. I read the last line and my heart went out to that little girl! So sad! I agree. Such things affect the children really badly. "Why should I leave? This is my house too..." Most women doesn't get the opportunity to utter these words in India. I know. Another sad reality. Ouch! What a thoughtful post. What a sad observation on when life goes wrong and we hurt the innocents. She did what she saw. :( that's so sad :( such domestic fights leave scar in children's mind. The effect such actions of parents has on their kids is huge and sadly they never realized it. Nice way of portraying a child's perspective during this agonized time. Your twists leave me speechless .... this was so touching ... brilliant as always. This one was so awesome.